Some Chimpanzees kill simply because they like killing. Chimpanzees are not killing each other because human are encroaching on their environment. 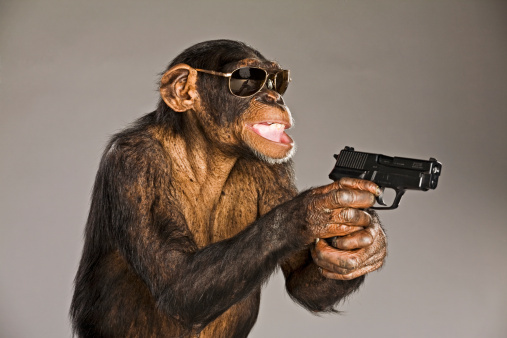 Studies shows that chimps are just genetically programmed to like violence. For years, anthropologists have watched wild chimpanzees “go ape” and attack each other in coordinated assaults. But until now, scientists were unsure whether interactions with humans had brought on this violent behavior or if it was part of the apes’ basic nature. A new, 54-year study suggests this coordinated aggression is innate to chimpanzees, and is not linked to human interference. As one of humanity’s closest living relatives, chimps can shed light on the evolution of people, such as when humans adopted warlike behaviors, Wilson said. But observations of chimpanzees by legendary primatologist Jane Goodall and other researchers challenged the idea that warfare is a modern human development. After all, humans and chimpanzees are the only two species in the world known to attack each other in organized onslaughts. Perhaps this behavior originated with a common ancestor some 5 to 7 million years ago, Wilson said. Yet other scientists counter that human intrusions are to blame for the chimps’ coordinated, lethal aggression. As populations in Africa grow, people are infringing on chimpanzee habitats. Loggers cut down forests; farmers clear land for crops, and hunters kill chimps for food. “People have argued that these increasing human impacts could also be putting more pressure on chimpanzee populations, leading to more chimpanzee violence,” Wilson said. He and his colleagues collaborated with researchers who are studying chimpanzees and bonobos, another ape that shares a common ancestor with humans. In all, the scientists collected data on 18 chimpanzee groups and four bonobo groups living in Africa. The chimpanzees exhibited 152 killings, including 58 that the scientists observed, 41 that were inferred and 53 suspected killings in 15 communities, the researchers said. The bonobos had one suspected killing, the researchers said. The different acts of violence did not depend on human impacts, Wilson said. This entry was posted on Friday, September 19th, 2014 at 11:23 am and is filed under Genetics. You can follow any responses to this entry through the RSS 2.0 feed.